The Hague is the location of the Binnenhof, the building where the national government of the Netherlands meets. Built in the 13th century, the Binnenhof is the home of the "Eerste Kamer" (literally "First Chamber") or "Senaat", and the "Tweede Kamer" (literally "Second Chamber"). These are the same as the upper and lower houses in some other countries. They form the "Staten Generaal" (literally the "Estates-General"). Willem-Alexander, the king of the Netherlands, lives and works in The Hague. His home is called the Noordeinde Palace and it is not far away from the Binnenhof. All foreign embassies and government ministries of the country are in the city, as well as the Hoge Raad der Nederlanden (The Supreme Court) and many lobbying organisations. All of this is unusual for a country, because The Hague is not the capital of the Netherlands, which is Amsterdam. This is made so by the Constitution of the Netherlands. Besides the buildings used by the government, the International Court of Justice of the United Nations is based in the Peace Palace, which is also in The Hague and often referred to as "The Hague" by metonymy. A tourist attraction is Madurodam, which has lots of tiny buildings that look like the real things. The Hague is part of a large conurbation called the Randstad, where most Dutch people live. It is only an hour away from Amsterdam, Utrecht, and Amsterdam Airport Schiphol by train (most of which are run by Nederlandse Spoorwegen) and with its two train stations, is easy to get to from many places in the Netherlands and all around Europe. 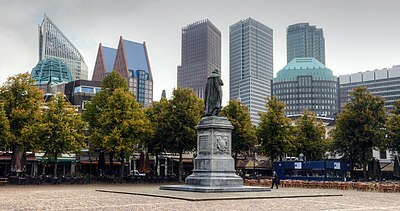 Wikimedia Commons has media related to The Hague. ↑ "Cookies op AD.nl - AD.nl". www.ad.nl.